Our world appears more chaotic than ever, yet from chaos come the best innovations. Three such innovative concepts were born out of our crisis: the Circular Economy, the Blockchain and the Ex’Tax Project. The Circular Economy is a regenerative system in which resources are kept in use for as long as possible; with maximum value continuously recirculated. Products and materials are offered as a service so that they can be recovered and regenerated at the end of each service life, i.e. no more cradle to grave, just cradle to cradle. The Blockchain is a continuously growing list of records, called blocks, which are linked and secured using cryptography. Each block typically contains a cryptographic hash of the previous block, a timestamp and transaction data. By design, a blockchain is inherently immune to modification of the data. The Ex’Tax Project is the proposal by Eckart Wintzen to bring tax on resources up and tax on labour down, creating a proper incentive to use abundant materials instead of scarce ones. Lower taxes on labour would make it more affordable to benefit from the abundance of the capacities of people, boosting labour force, craftsmanship and creativity. Now, let us imagine that these three innovations, put to good use, could set up the foundations of a new era for any societies across the planet. 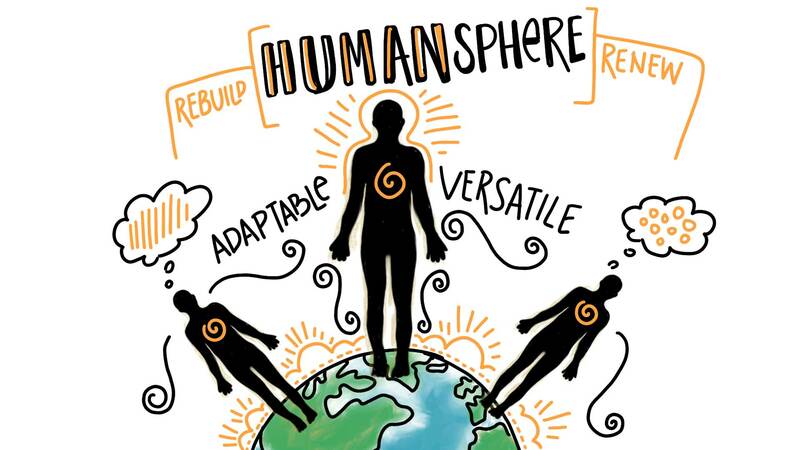 One could be designing them in such a way to generate well-being on earth, for all of us. Not possible? Let’s see. The best way to design a circular world is to consider that waste should not have existed in the first place. This is now recognised as a fact: waste is the result of a poorly designed economic model based on the ownership of a product, as well as its legal responsibility, both transitioning from manufacturers to end-consumers, thereafter ending in landfills. 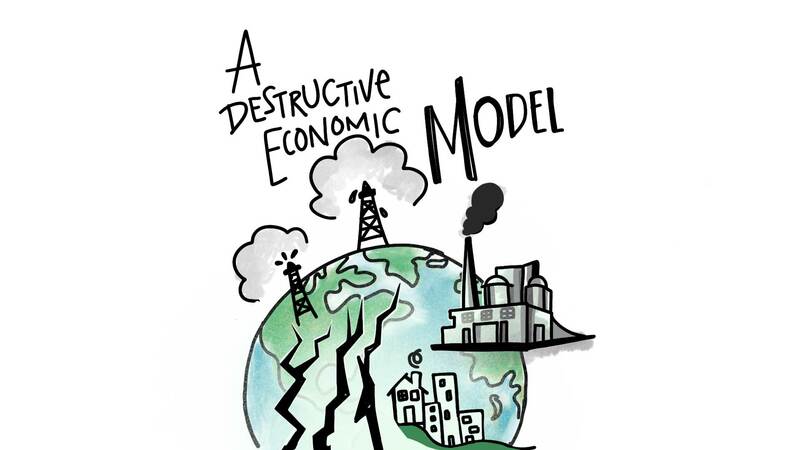 Our ‘throw-out’ economic model ensures that the more we buy products — often for single use — the more often we need to buy them to satiate our dependency. At the end of this chain, we end up with gigantesque amounts of waste that we try harder to repurpose. Today, we have to design waste out of our systems at the front end of the design stage, making durable products, preferably offered as services. They would be used for our needs and then, once fulfilled, would be designed to pass on to the next user, after repair, maintenance or refurbishment. Here waste is considered the root cause of our environmental challenges. But does that suffice to address our systemic challenges? Rethinking relations between the economic and the environmental is a great approach to hopefully fixing the way we live by sharing access to resources. The Circular Economy is often considered as being our next economic model given that it provides a response to businesses’ economic resilience. But how about adding a social dimension as well as a holistic value-based method to the current model, ensuring we stay within boundaries while aiming for the genuine well-being of all? Why not, whilst wearing these “circular lenses”, also rethink the origins of our societal negative externalities? If waste is the root cause of our environmental patterns, poverty is the one to consider for our social systems. If we can design waste out, why not apply circular thinking to design poverty out too? This way the model´becomes fully inclusive, ensuring all will benefit. Neither waste nor poverty are produced in nature. Both are inventions of our economic systems. They need to be eradicated at the same time so as to shift the paradigm once and for all. This advanced approach of eradicating both waste and poverty out of our system is what we call ‘Circular Economy 2.0’. And this could be made possible with the help of new technologies and tax regimes. Touted as being the “biggest innovation of the past 250 years” (Tapscott, 2016) the blockchain’s inherent architecture means we have the capacity to be even more effective with how we transact and exchange values. Up until now, price has determined our values in the market place, often at the cost of society and planetary boundaries. Imagine a system where the value of the transaction is determined by the level of impact a good or a service has on the planet and its people. Imagine being able to transact intangible values, such as love, wellbeing, harmony. Imagine being able to digitise the impact of our transactions, recording transparently and immutably, those transactions which align with the key principles of a Circular Economy and those that don’t. Now imagine what an incentive such a mechanism might have on influencing consumer and producer choices. With Blockchain technology: supply chains, products, services, communities can all be cryptographically stored on an immutable ledger; all capable of being coded to demonstrate the extent of their — positive or negative — impact on natural and social capital. In effect, the Blockchain will allow us to redefine how we currently see value. Our ‘current see’ or currency has historically been very limited. With Blockchain, (our emerging ‘current see’) we can transact meaningful, regenerative values alongside financial values. Thanks to Blockchain, the Internet of Value (IOV) has arrived. We can start engaging with consumer choices that value the earth and its people as if they mattered more than centralised profit shares. Blockchain has the capacity to eradicate the linear extractive and destructive aspects to stocks and shares. It will allow us to truly take stock and share our collective bounty and creativity. Since the beginning of the industrial revolution, finite resources have become increasingly controlled by centralised corporate structures. To date, around 1,318 transnational corporations currently control the majority of the planet’s informational, material, energy, financial, food and water stocks and flows (Glattfelder, 2011). There are obvious benefits to centralised systems but as the core concepts of a Circular Economy identify, centralised control (when viewed from a living systems perspective) leads to imbalance, brittleness and low resilience thresholds. The 2008 global financial crisis is testament to the consequences of depending on too brittle a centralised financial system. Global inequality is also such a consequence of centralised control systems with eight individuals alive today owning a combined wealth equal to the collective wealth (or poverty) of four billion fellow human beings. All of these principles can be architecturally configured within decentralised autonomous organisations (DAO’s), where consensually agreed upon protocols determine how value is measured, tracked and exchanged. Blockchain technology (BCT) is ripe for circular economic interaction. BCT offers a shift from centralised vertical scaling to distributed lateral scaling. BCT ‘smart contracts’ enable decentralised and secure resource sharing, anywhere between peers who are hyper connected via the same smart contract platform. 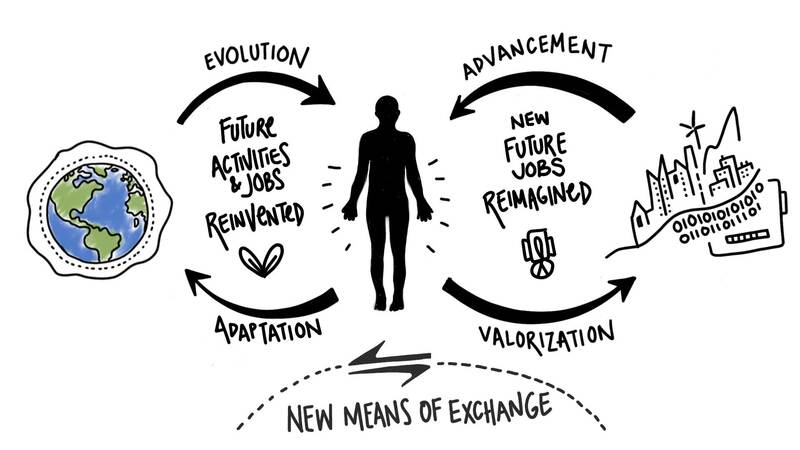 With the application of BCT, organisations and communities can design and build smart contract platforms which will rapidly upscale equitable circular economic activities through digitally integrated value chains — built for resilience — used within the multiple realms of not for profit community initiatives, private businesses and even local governance (for instance, human-centred Circular city structures). There are many examples of blockchain based initiatives emerging exponentially. The most powerful promise of BCT however, is the opportunity for humanity to redefine how it values itself within an economic context. To date it has been our utilitarian capacity, our level of productivity that primarily deems us as economically valuable. With Blockchain and the rise of Artificial Intelligence (AI), we have an opportunity to reimagine and redefine what makes us unique. Perhaps we can be here to demonstrate our infinite creativity on a finite planet and recognise that we are able to be valued not for what we can extract from each other (our utilitarian capacity), but for what we can learn from each other (our creativity, diversity and uniqueness). A tax shift from labour to pollution redirects the creative force of entrepreneurs from focusing on reducing headcount to smart resource use. In this approach tax is not a penalty on innovation; innovation can run freely, as long as it’s safe and, hopefully, just. This approach makes it more likely for people to find new roles if and when their chores are taken over by machines, and within the context of our environmental boundaries. The greatest opportunities exist when technology supports, complements and amplifies the talents of people, as explained above. If we want humans to flourish in balance with our natural systems, it is time we update our tax systems to match 21st century challenges. Only humans can perceive value. Introducing the notion of circular value creation could ensure our priorities would remain on addressing people’s needs thanks to material circularity. 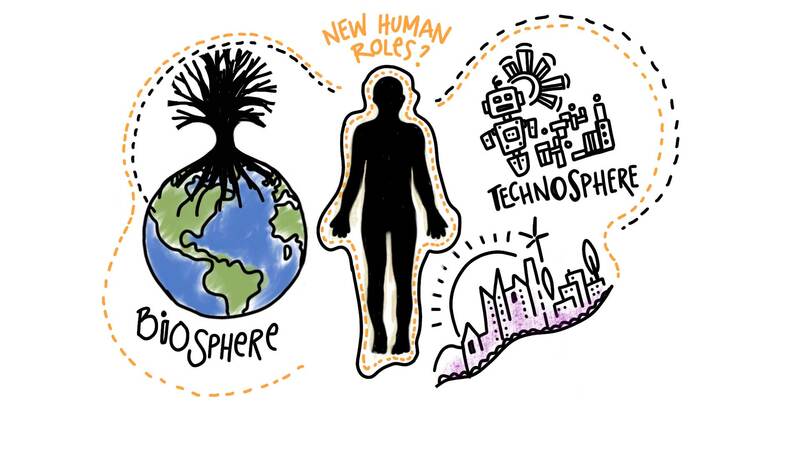 With this ultimate goal in mind, well-balanced societies could rely on a human-centred Circular Economy — with a Humansphere(5) at its core -, be powered by a safe and just tax program and fueled by a carefully designed Blockchain strategy (among other diversified means of exchanges). Designing waste and poverty out of our systems is a vision we can work towards with collective passion, audacity and hard work. We may be successful, we may not, but at least we are trying harder. The vision is set. Tools are available for its implementation. This is now a matter of leadership and collective willingness to succeed. 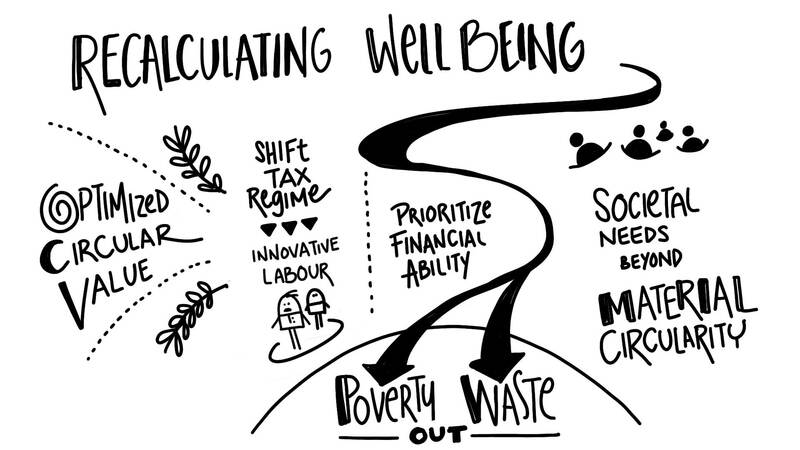 Building genuinely designed equitable circular societies is no longer a dream. It could be our reality. 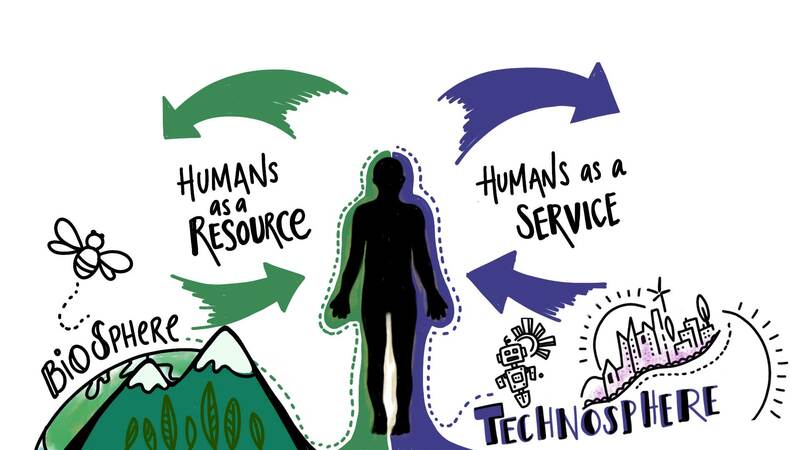 (3) New humans roles could be reinvented based on two new business models: humans-as-a-service and humans-as-a-resource, but not limited to. (4) Optimization of Circular Value (#OCV) is an approach of a new concept of value creation based on our ability to regenerate natural, economic and social cycles. 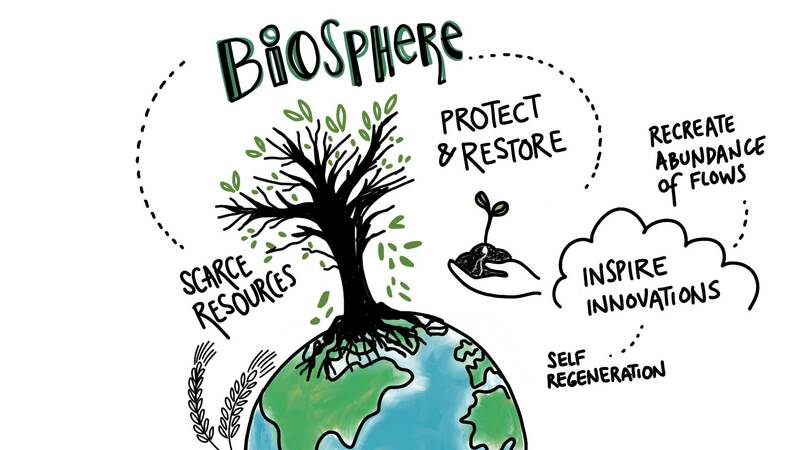 (5) As proposed in the concept of ‘Circular Economy 2.0’ (eradicating both waste and poverty out of our systems), a Circular Humansphere is inserted in the circular economy ‘butterfly diagram’ to enhance the decision-making process when designing a project or a service. It is based on our three stocks of available resources (Natural Capital, Human Capital, Remanufactured Capital) as well as our abundant or endless flows of energies available (renewable energies available from the Natural Capital as well as from the Human Capital).